Helen Singleton was a student at Santa Monica City College when she joined the Freedom Rides, along with her husband, Robert. They were arrested July 30, 1961, at the train station in Jackson. 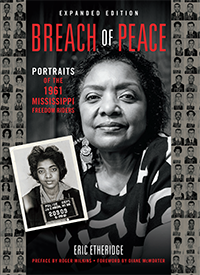 Helen, whose mug shot and portrait are featured on the cover of Breach of Peace, has worked as an artist and an arts administrator, consulting for such organizations as the Los Angeles County Museum of Art and the California Arts Council. She and Robert live in Los Angeles. Both political parties are saying they don’t want another lengthy election season like the one we just went through. But for the campaign of 2008, America needed every moment of it. It took 21 months to grasp the mettle of Barack Obama, and the process revealed a lot about us all. As an African-American who participated in the Civil Rights movement, I felt a familiarity with Obama’s task. It had taken years of struggle and suffering for our efforts to result in the Civil Rights Act of 1964 and the Voting Rights Act of 1965. Many Blacks were wary of his candidacy. We’d seen dreams deferred. And, though we knew there were many white Americans who believe in racial equality and would judge him on his merits, would enough white Americans vote for him? I watched with apprehension as hidden prejudices were revealed. And with guarded glee as Obama carefully stepped through racial and political minefields. I tried to understand some voters’ resistance to him. He didn’t have a history or a story that they could relate to. He hadn’t experienced that historical relationship that whites had with Negroes, Coloreds, Blacks, African-Americans. He wasn’t a sharecropper’s son who had pulled himself up. He wasn’t from a part of the country they could identify with culturally. He had lived in a foreign country that most Americans couldn’t find on a map. His family wasn’t poor. He didn’t have that “Presidential” look that conveys experience and wisdom. His family wasn’t rich. He was rising too fast. He had not been tested. Who does he think he is? But he grew on us. In these 21 months we saw discipline. We witnessed toughness where difficult decisions demanded it. We saw an organizer extraordinaire. We learned from his philosophy. We agonized while he deliberated and gradually realized his brilliance. He was a quick study. He listened to those who disagreed with him. He empathized with the less fortunate. He gave credit and recognition to those who helped him. He seemed indefatigable. He kept his cool in crisis. He was what we needed in a leader. Yes, he stands on the shoulders of those who struggled for social justice. But I am not just proud that he is African-American. I am proud that he is exceptionally well suited to lead the country at this time. And I am proud that most Americans by choosing him chose a new identity for the nation as a moral leader of the free world. I am proud that we are beginning to live up to our promise. Yes, we are the ones we’ve been waiting for. I wish my parents had lived to witness this. Thank you for being one of those shoulders that President Obama will stand on. Without your courage we wouldn’t be here today. I’m in tears… just so inspired by you and this moment. KNOW HOPE. Another great and moving post.